I don't know if people here will enjoy this, but it's worth sharing since everybody here is interested in communicating natural hazards and warning people in order to save lives and property wherever possible. What would you do if a volcano near 25 million people had been having a low-level eruption since 1994 and then you spotted a large amount of magma rising in it (and knew that this volcano has had major eruptions and other events in the past)? 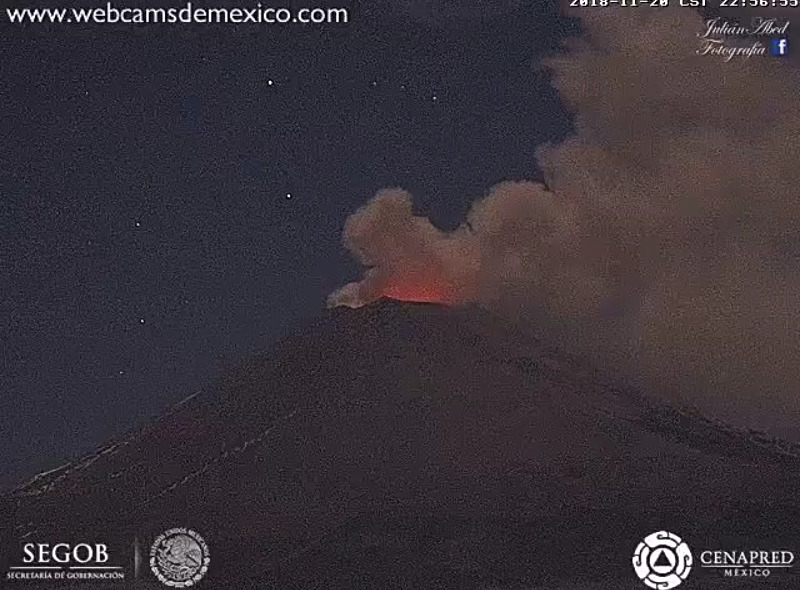 That's what's happening at Popocatepetl near Mexico City; it's definitely a "Mount St. Helens 1980" situation, but even more serious because of the dense population centers: yes, both Mexico City and Puebla, another big city that's on the side of the mountains, are at serious risk, and so is the heavily populated surrounding region. And this is also a nation's capital, major transportation hub, and one of the world's largest cities at risk. Here's a paper by experts, made freely available, that gives good background information (up to this past weekend, anyway) as well as an in-depth discussion of how emergency managers are monitoring and communicating the risks in this long-term crisis. This past weekend, University of Mexico volcanologists announced that a lot of magma is rising in the volcano. They haven't changed the alert status yet (Yellow Phase 2), but there are signs all around that everyone is expecting something big. This would be a 1980s-style media circus if it happened in the States, of course, but it doesn't get mentioned because it's happening in another country, probably won't physically affect us even if it's one of Popo's historic VEI 6's (think Pinatubo 1991), and the coverage is in another language, for the most part. I just wanted to let people here know about it, not only because it's an upcoming natural disaster brewing, but also because of the crisis management aspects. The online Mexican media that I can read with my terrible Spanish and lots of dependence on Google Translate are focusing on the serious information that people need to know, and people seem to be handling it all right thus far. Local authorities are using social media to keep people up to date. It's just fascinating. CENAPRED is the government agency that issues daily updates and sets the alert level. In this morning's alert, they gave detail about the harmonic tremor for the first time I recall. I really like Popocatepetl because it is a beautiful Mexican volcano and, at least up until now, hasn't been all that threatening in its eruption style. How can you not love a volcano that looks like that? Once it goes off, of course, there is going to be lots of English-language coverage, but in the meantime, I've got a page going, live-blogging news and CENAPRED announcements, in English, if anyone is interested in following how authorities manage this crisis, which is in a rather acute phase at the moment but, thus far, has not led to any public panic. They're repairing evacuation routes, per news stories; making plans to evacuate 700 schools on the volcano's flanks--again, this is a very heavily populated area; and preparing evacuation shelters. And watching. And waiting. To get some feel of the atmosphere in the volcanology world over this, not just in Mexico, check out an old book called Volcano Cowboys. It focuses on the 1980 Mount St. Helens crisis and Pinatubo in 1991, among other disasters, and how these led to the establishment of volcano observatories, the US Volcano Disaster Assistance Program, and other innovations that are probably going to save a lot of lives now when Popo finally lets go. Reading about Popocatepetl as a kid was one of the first things that really got me interested in earth science. Reading volcanologist Erik Klemetti's posts at various blog sites, from Big Think through Wired to his current gig at Discovery, introduced me to these scary marvels. Then I saw Popo in the webcam--there's just something personable about that lazy ellipse of a crater, and the way light plays on it. Just found the NOAA page for Popocatepetl. Something to keep an eye, just in case. 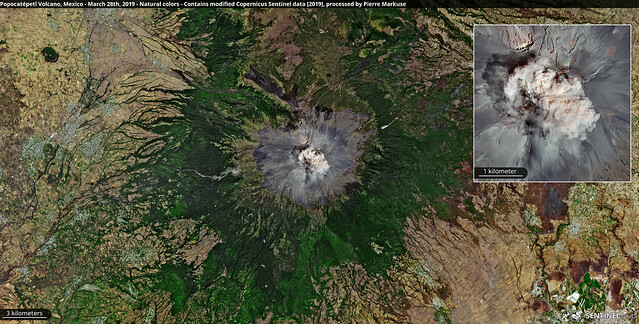 PS: A longer view, of the volcano's south flank, doesn't show a high column, which is reassuring. 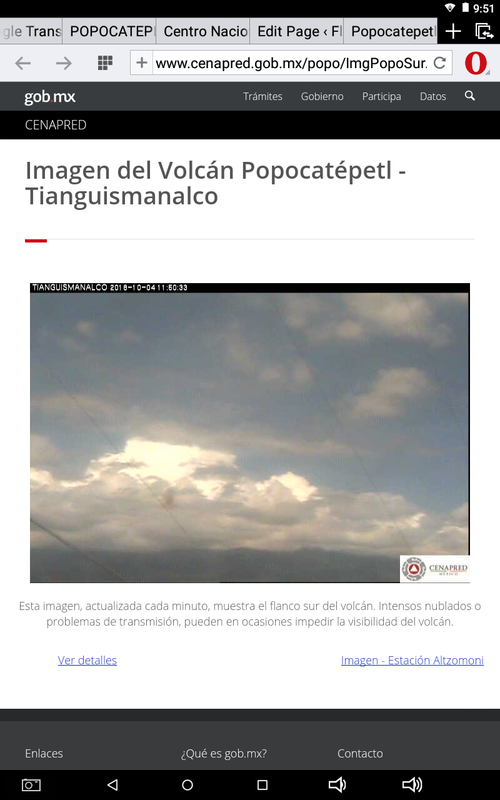 Um, should mention that the bright white stuff in that Tianguismanalco image is steam generated by the volcano, not a typical weather cloud. Popo emits a lot of that, in addition to ash. ? whether the residual clouds in the image are meteorological or volcanogenic. Update, October 5th: Just for visual reference in the above image, here's a clearer view this morning from that same webcam, showing remnant ash from a light eruption that happened about an hour ago. These typical vulcanian events are still happening just as they have over the last 24 years, though somewhat bigger and much more frequent. The thing everyone is worried about, though the volcano remains at Yellow Level 2 alert level, is the increased possibility for something a lot bigger. More magma is reportedly available, but it takes a lot of other conditions to set up an eruption and those apparently haven't fallen into place yet. Still watching and waiting . . . In case anyone is wondering, this video--pictures are worth a thousand words!--shows major Hurricane Willa's forecast track in relation to Popocatepetl (the volcano icon puffing on the left) and, I think, Fuego in Guatemala (on the right). Fortunately, Willa will stay north of these active volcanoes. 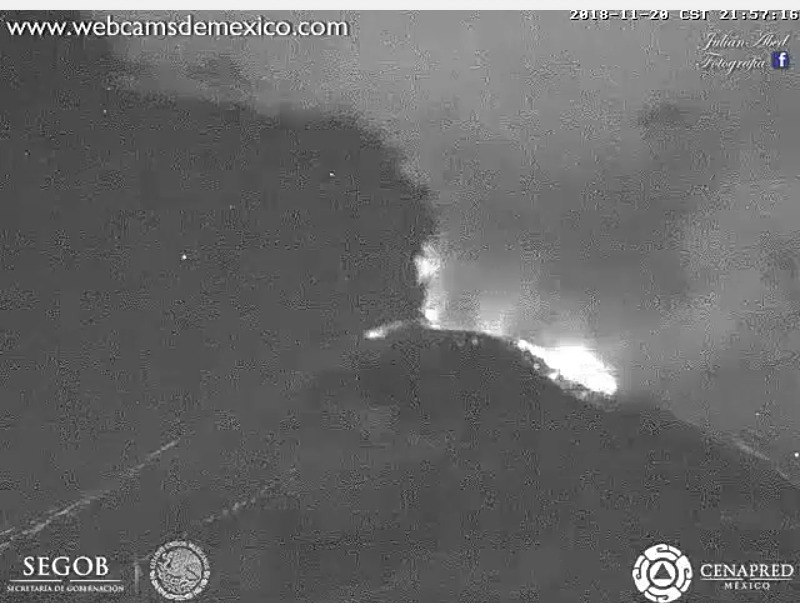 Don't know how closely anyone is following this, but if you are interested, someone is now posting daily videos on Popocatepetl taken from 4 of the CENAPRED webcams here. 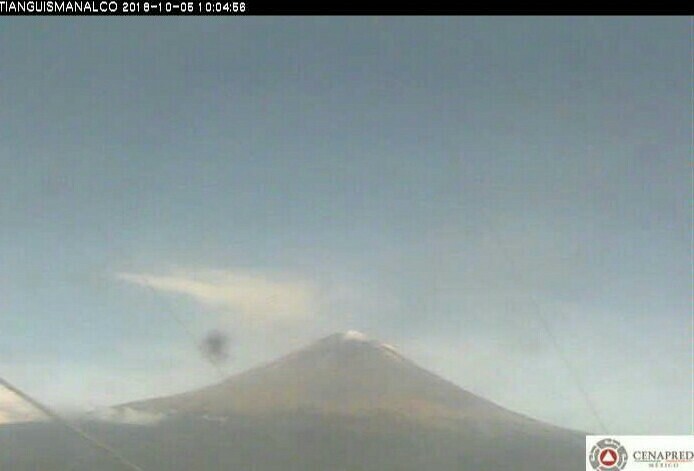 The volcano has been relatively quiet in the last 24 hours, without a VAAC ash advisory since the 12th of November, but this morning's YouTube video is a decent weather-cam show--they are dealing with a cold front down there at the moment, and since Popo is North America's second-highest volcano (almost 18,000 feet a.s.l. ), it's covered with snow; you can't really see it very much, but wait for it and, in the upper right image, you'll see some steam puffs up there near the summit: fire and ice, indeed. Also there's a shot of the volcano's lower slopes before and after a brief snowstorm. It's scary to have such a dangerous active volcano hiding in the clouds, though Popo is very closely monitored and local communities have early warning systems and frequent reinforcement of emergency moves; hopefully, things should clear up soon. I truly hope that Popo is just having one of its typical events; however, it seems to be trying to pack a little muscle into this one, although the plume hasn't yet overcome the summit winds. 3:32 p.m., Pacific: A CENAPRED official just tweeted that the alert level is the same, and the cams show (at least at the moment) that activity has dropped dramatically. Think this one is over. Whew! I don't know how people living near this volcano can take it -- for 24 years now, and much more so recently, it's been like having a supercell overhead, with a rotation signature, and funnel clouds occasionally drop down, but you must continue to wait for one to touch the ground and start some trouble. Gah! 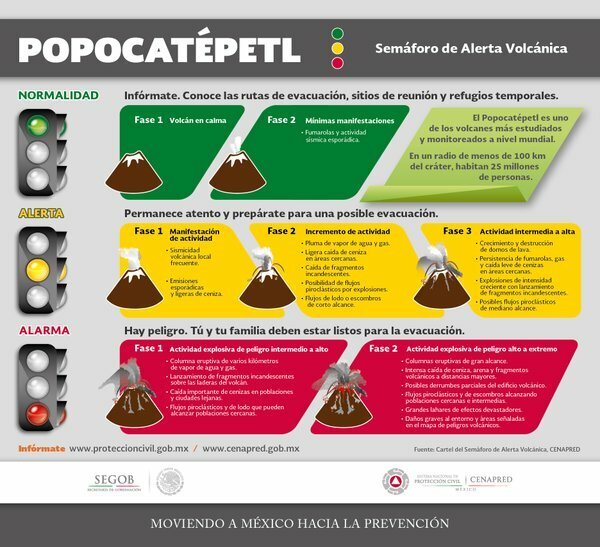 Kudos to all the scientists, emergency planners, and government officials for handling Popocatepetl's crisis so well! This particular episode, again, is a change in activity--an increase, too. The volcano is definitely working itself up; the question is, when will it happen? OK. Starting this afternoon, Popo began showing a lot of tremor, and it gradually cranked up until a continuous show that is impressive looking but not violent by "typical" volcano standards--Washington VAAC hasn't put up an advisory and the Mexican authorities are keeping the volcano at the same alert level (Yellow Phase 2). I haven't seen this continuous level of bomb-throwing and summit explosions in the last few years that I've been watching the volcano cam, and suspect/hope that the large amount of magma the scientists mentioned has reached the surface and now is just erupting steadily but relatively slowly, with the conduit remaining open and no big blast building up. Hope so! It may go on for a while, changing the shape of the summit and causing some pyroclastic flows that may or may not threaten nearby villages. I hope that's all this turns into. Anyway, still am live-blogging it, if you want to follow along or get useful links/background info. This is from the camera linked at the top of this post; once they were fiddling with the lens and set it on natural color: in the bright moonlight everything was a shade of blue except the "white" parts, which were red and orange. Gorgeous! Hope this is the worst Popo will do on this go-round. And it is really firing up the past week. That was on the 27th; it had a similar one last night. Nothing but the typical simmering in between. This is a looooooong volcano crisis, but everybody overall seems to be handling it with patience. It must be terribly stressful for all those people, though, and I think everyone monitoring Popo deserves a medal for longstanding guts and clear thinking in the face of great unpredictability and danger. In this morning's update, CENAPRED did announce that they've raised the alert to Yellow, Phase 3 (it was Phase 2): more explosiveness, basically, plus the possibility of medium-distance pyroclastic flows. This is a subduction zone volcano: there will not be runny lavas traveling long distances like we saw last year at Kilauea. Here's a graphic of the alert system (sorry, can't translate it here, but as you can see, the next step is dire). This excellent article (Spanish) has background from a University of Mexico volcanologist on the current events. And it was just in the last week or so that a bunch of young men summited the volcano, ignoring the no-go zone! The volcano is adjacent to at least three states (Mexico, Morelos, and Puebla) and local governments have improved coordination and planning over the last few months. Evacuation routes are monitored, and then monitored again. The volcanologists communicate everything they know and see in clear, easy-to-understand language, and from what I've seen of local news through Google News, most journalists are handling this in a responsible manner (though there are a few exceptions). There are also many public education programs in local communities, reinforcing the message on what to expect and what to do in an emergency. The explosions last week could have been a lot worse, obviously (lateral blast or flank collapse, though that catastrophic failure historically has happened on Popo's southern flank), but still, that is a real bad location. It's facing northeast, I think: the general direction of Puebla, a very densely populated state (Mexico City/State of Mexico is on the western side of the volcanic ridge). Also, the summit crater is full: from what I've read, this boosts likelihood for pyroclastic flows down the flanks. Not surprisingly, even though it's Sunday, they've talked with the governor and boosted efforts to clear evacuation routes in Puebla State ASAP. About four hours ago, after producing prodigous amounts of steam all day that reminded me a lot of cumulus towers rising over Mississippi in summertime (only faster), Popo began a continuous ash emission. It's low-level enough to not have produced any reports of ashfall yet, per Civil Protection about half an hour ago, but it is continuing, and that is a change of activity for this volcano. They haven't changed the alert level; it's still Yellow Phase 3. Civil Protection says the ash went east at first but now is headed south (away from Puebla and Mexico City, at least, though that region is still heavily populated). Just a heads up -- might settle down; might not. Update: Now they're saying east to northeast with the ash, an opinion shared by Washington VAAC. Not likely to ever reach the Gulf states, except maybe a high-altitude grain or two, but with something bigger . . . ? 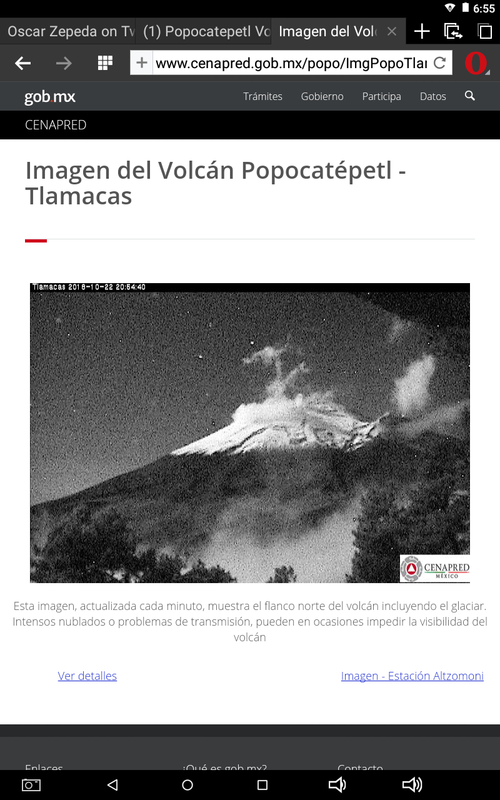 Anyway, here's the volcano cloud imagery page for Popocatepetl, 250 m. Just select your image type. A quick update: it didn't escalate, but it's ongoing at a very low level. I'm hoping that this is Scenario 1 the experts mentioned yesterday (Spanish), in the morning, just without lava domes. The two recent explosions may have opened up something a bit. Here's a Sentinel image, via Pierre Markuse, CC BY 2.0, of the March 28th explosion: you can see it's coming from that big hole seen in the overflight video up above.